I’m definitely one of those types who learn best by doing. Oh, I did well with book and classroom learning when it really counted through my school years. Since then, though, I’ve learned far more by just diving into things and developing skills and absorbing knowledge along the way. My rather limited gardening experience comes more from trial and error than careful study. I pick up languages well on-site where they’re used, which is so much more engaging than in a classroom. After all, I don’t think a language class would have taught me how to order ice cream in Turkish, but I picked that up quickly on a trip to Turkey! And my immersion into knitting began with buying some beautiful locally-spun yarn, then teaching myself how to knit it (thanks in large part to Vogue Knitting ). This mode has played out in my professional life as well. Fresh home from two and a half years in France, having studied and worked at La Varenne cooking school, I got a job as food editor at Simply Seafood magazine. I’d written just one magazine article at that time, and had never worked on a magazine staff. But they trusted my freshly-minted culinary training and liberal arts education (and maybe something about my can-do nature and confidence) to be strong enough indications of my ability to perform well. I jumped off the deep end, relished the on-the-job development of new skills and it remains one of my favorite work experiences to date. The penchant for learning-by-doing has manifest itself again in my recent plunge into digital self-publishing. Though I’ve written, edited or otherwise contributed to a few dozen cookbooks in my career, I’m not sure it did a whole lot to prepare me for this thoroughly new experience. Over the past four or five years, I lost track of how many workshops, seminars and webinars I attended on the subject of ebooks. I’ve had countless conversations with colleagues and read lots of blog posts on the subject. Facts and figures, personal anecdotes, publishers’ perspectives, PowerPoint charts, heated discussions, industry overviews….I’d consumed untold amounts of input on the subject but eventually realized that no amount of info-gathering was going to offer complete enlightenment. So I decided to grab a big machete, dive into the fray and hack my own path in that jungle of epublishing. I feel far from an expert in ebooks, but I became just expert enough to produce the titles discussed here. Because the landscape is changing so quickly, and we each have different goals and wishes for our ebooks, there simply isn’t one single best-bet that fits all scenarios. But after so many folks approached me for input, clearly facing a lot of the same challenges and uncertainties about how to precede, I wanted to offer a bit of food for thought. So I share here some highlights of my own epublishing process in hopes it might shed some light for others considering a dive into that jungle. Though I intended to produce fully worthwhile, ready-for-public-consumption products, I also approached this as a bit of an experiment. I’d be investing time in learning the practical and technical aspects of developing content to epublish, plus investing in other professional input (more on that soon), so I chose not—at this point—to invest also in the creation of fully new content. And the timing was just right. In the early 2000s I’d written four single-subject books about Northwest foods and three of them were out of print. The content was, in my mind, fully evergreen. Information about the history/culture/geography/personality of salmon, wild mushrooms and crab would not have gone out of style. And I tend to write recipes that aren’t too steeped in current trends, so trust they’ll hold up well as years go by. I acquired reversion of the publishing rights and got rolling. The original books had been about 90 pages long, each with 40 recipes and a decent amount of frontmatter (history, regional context, species information, seasonality) and backmatter (buying/storing tips, preparation methods, events calendar, resources). Rather than reproduce them in that original structure, I chose to chop them up and create seven smaller books from the three originals. This killed a couple birds as far as I could see. One was to give readers more selection and variety. Rather than compartmentalizing the subjects, I’d mix wild mushrooms, salmon and crab in some of the books. Maybe the buyer doesn’t care all that much about how wild mushrooms grow and the range of species found in the Northwest but just want some great appetizer recipes. 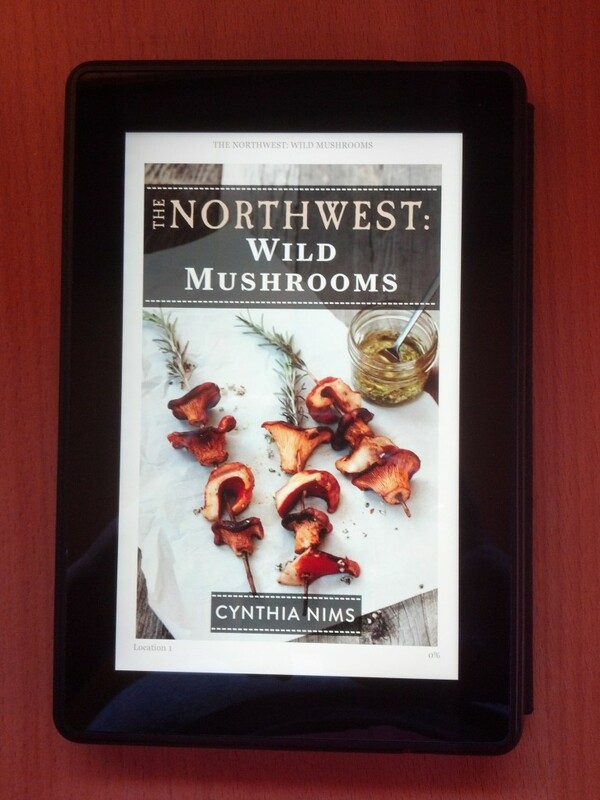 So they can now pick the Appetizers book with a bunch of Northwest-inspired recipes to choose from. But if they are keen on knowing more about Northwest wild salmon, the salmon book has all the species-specific information plus ten recipes that exemplify delicious ways to serve the fish. And the digital arena seems to relish smaller bites of more focused content, with a smaller price tag to match. I saw it as a way to allow folks to buy individual chapters rather than having to commit to the whole book. The seven final products are Wild Mushrooms , Crab , Salmon , Appetizers , Breakfast , Main Courses and Soups, Salads & Sandwiches . For the most part I didn’t update the content. Again, much of the material was evergreen in nature. Though in the early 2000s there was much less discussion of sustainability, that’s a topic I added material about for the Salmon and Crab books. And in methodically verifying details (I couldn’t leave well enough alone and trust that all was still as correct as it had been when first published!) I did indeed find that the mycological crowd had changed nomenclature for a couple wild mushroom species, with others still in consideration. So there were some minor tweaks in that regard. The resources guides and calendars of related events were thoroughly updated. Otherwise the material went largely unchanged. I’m sure I spent more time going around in circles about which platform to choose than I did in finessing the content once I’d figured it out. One minute I was 99% convinced I’d sign up with a third-party tool like BookBaby or Smashwords, the next I’m hearing someone tout PDF downloads as the best way to go. But, geez, Kindle sure was making a good case for their self-publishing tools. And I was doing most of this research last year, I trust the array of options is even bigger now. I’ll spare all the details of my decision-making process, in large part because this really IS something everyone needs to figure out for themselves. Your platform for sales, your interest in customized formatting, what fee and royalty structures make most sense for you, how much time/energy/money you want to invest in producing the content, the list of considerations is a long one. What surprised me most in the course of all my delving around was that I came up with not one person who was contracting out their expertise in ebooks to folks like me. A one-stop-shop individual who could take a Word document and consult with an author about priorities for the book and help them with the technical aspects of bringing an ebook to life. Even small custom publishing companies, which I think would be ripe for fulfilling that need, were dead ends. Perhaps that’s changing in recent month, seems like a great opportunity for the right people to share their expertise! In the long run, I opted to produce my books with Kindle Direct Publishing. In large part because this how-to guide they offer free makes it very easy to produce the content in Word, using some specific formatting they outline in great detail, and they take care of conversion to their .mobi format painlessly online. A down side of that option is that it means the books don’t show up in other ebook libraries, like iBooks, Nook or Kobo shop lists, an important consideration. But on the positive side, Kindle makes available a free app that makes reading Kindle content possible on any devise that can load the app. Hard to know how many potential buyers know that last detail, but I’ve pointed it out as often as possible when getting word out about the books. One of the key things to figure out is how much control you want to have over the book, particularly after it’s published. This was the deciding factor for me, after having talked with a friend who had initially published through a third-party service but was endlessly frustrated about the delay in making updates or changes to the content. Want to change the price? See an error you want to fix? Late-breaking information you want to add? It required submitted to the publishing service and waiting for them to implement. With Kindle I’m able to fix a bad URL in the content and repost the updated book in a matter of minutes, and receive a notice within an hour or so that the new version is live in the store. An added bonus in this digital world is that up-front costs can be very low to produce a book. All the services I looked into were free, at least for a basic level of publishing. If you go hard-core DIY or bargain with friends and colleagues to help create the content, costs can be quite low. And if you self-publish, you can pick and choose what tasks along the way you want to farm out. It’s great to have that degree of flexibility. As one who’s written more than a few cookbooks in the past, I found the biggest mind-shift I had to adjust to was the fact that the user has control over the viewing experience. Type/size of device, margins, line spacing, text and background colors, font size, screen orientation, these are among the variables that can be in the user’s hand, impacting how the material shows up on the page . In fact, the idea of a “page” becomes a pretty foggy concept altogether, I should have said “screen.” Making sure ingredients are all one one page or avoiding a couple widow lines at the end of a section, wishing to have a sidebar about how to peel tomatoes alongside the salsa recipe. Don’t count on it. But on the plus side, thanks to the digital arena instead of “see next page” or “turn to page 47” for any related or supplementary information, you can directly link from one spot in the text to another, a fail-safe connection unfettered by user-generated format changes. While there are bells-and-whistles options for more elaborate or complex presentation of content, it would have meant me either developing a new toolkit of technical skills or paying someone else who has them (whether a savvy person or using various conversion tools available). But the latter would have gotten me back into that working-through-a-third-party scenario and the former I just didn’t have the time or inclination to do so. So I stuck with the more DIY option, which suggested a KISS approach to get the best results. You know KISS, right? Keep it simple, stupid. Honestly, I didn’t have much trouble coming up with formatting that I was happy with following the basic Kindle cues. I like boxes of text in my cookbooks, small bits of information that may be an aside of sorts, related to surrounding text or a quick tip that could be of broader interest than for a single recipe. Setting it off in a box makes it stand out a bit and provides some visual break from the flow of content. But after fussing with trying (to no avail) to reliably create boxed text, I just left that information in the flow of other content, set off with a heading that allows readers to reach it from links elsewhere in the book (including the Table of Contents). That was probably the biggest concession I made regarding the textual content of the books. The consideration of visuals was another big shift from print cookbooks I’ve worked on recently. Lots of full-color photos are de rigeur in publishing today, something book buyers have come to expect. This is one area where food bloggers who already take lush photos for their blogs have an advantage: they’re set to take great shots they can include in an ebook. I have a blog and include photos with posts, but don’t consider myself a photographer. I was determined to have at least a striking photo for each cover of the book. Given the browsing experience for ebooks means that the first impression often comes in thumbnail-sized form, I wanted the image to have impact, I wanted the covers to stand out. So I got off the DIY path here and hired a local photographer. One cover photo for each book, plus a couple other recipe shots for use within the content. For seven books, that was already a lot of shots. I spent a lot of money on those images, and it definitely delays my recoup of overall expenses through sales by a good measure. This is something I’ll be rethinking before doing another ebook. For starters, I’ve invested in a good camera and am working on my own photography skills. Other authors I know have partnered with someone who could take the photos, more as a collaborator. That seems like a sound option! For the covers, it was no question: I definitely wanted to go with outside help. I worked with a designer in England based on recommendation from a friend and was very happy with that. Again, the cover — even in that thumbnail size — has taht first-impression impact in ebooks just as in print books. It made sense to invest in professional input here. If I had found a freelance ebook editor with active and current experience in the arena at any stage of this process, I likely would have engaged him or her to help me cut this path. Even if just for a couple of hours to get practical, customized input about–say–the top three platforms I should consider given my particular objectives and the pros and cons of each. Had I found someone offering that service and affordable enough to have along for the full ride, it would have been great to have help to finesse the formatting of text, more polished positioning of photos, maybe figuring out how to do those text boxes that I so adore! As I poked around various platforms and read what all they had on their menu of options, I think pretty much all of offer not just the publishing element but also some degree of fee-based services if you want some help with cover design, copy editing, document formatting, etc. This is easily the most challenging part of the adventure for me. It seemed like such an accomplishment to get the darn books published in the first place. Of course, that’s exactly like any other entrepreneurial venture: it’s not enough to make an amazing batch of crackers or design slick web sites or be the world’s best dog-sitter. In a noisy world that seems already packed to the gills with products and services at our disposal, the biggest key to success comes less in the product and more in the selling. And, as it true for so many in my boat, selling myself and what I produce is an incredibly challenging skill to pick up. So to date, sales of the books have been slow. I’ve done a few promo options by way of the Kindle Select program. I made up some postcards to hand out at conferences or random gatherings. I’ve done some social media, occasional blog posts, etc. Reaching out to colleagues in the press. I clearly need to be doing more here, which means I’m still in that jungle, machete in hand, working to forge that path. I know other cookbook authors have been having good successes, so I’m still plugging along and looking forward to some of that traction kicking in before long! Let’s just say I haven’t put the machete away quite yet. I’m dropping the Kindle Select program and will forfeit a few perks that, for me, haven’t been beneficial much at all, to gain the freedom to distribute the books to other platforms for greater visibility. And I learned recently, after I queried the Seattle Public Library system about how to make the books available for e-checkout, the channel they use to lend ebooks is also unavailable by the Select parameters. I’ll be curious to see how much that changes the sales activity. All in all, I came to think of this whole project as a sort of independent-study masters thesis. I learned a lot in the process, there’s no doubt about it. But like any good research project, it also unearthed lots of ideas that I could, and probably will, continue researching for years and years to come. I already have another ebook idea bouncing around that will give me a chance to revisit this new path, possibly taking some different turns here and there. As the process becomes clearer and more comfortable over time, I look forward to getting rid of that machete.